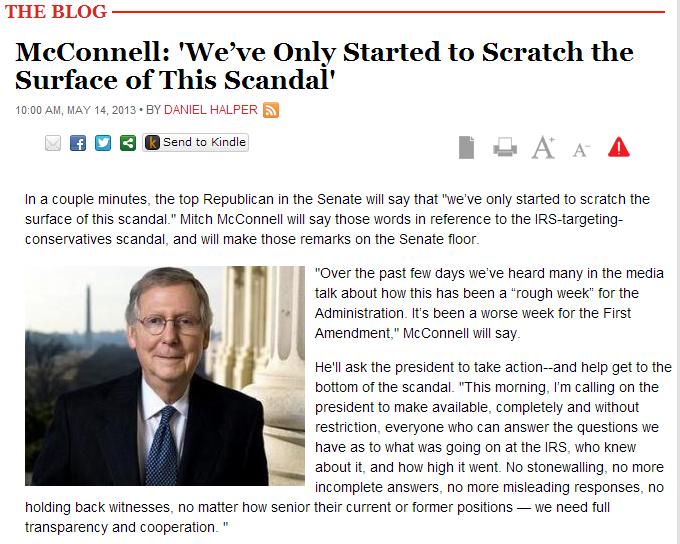 SENATOR MITCH MCONNELL: WE’VE ONLY BEGUN TO SCRATCH THE SURFACE OF IRS-GATE……. – The Tundra Tabloids……. SENATOR MITCH MCONNELL: WE’VE ONLY BEGUN TO SCRATCH THE SURFACE OF IRS-GATE……. Well then, Senator Mconnell, give us a sign that you’re serious and demand a congressional investigative committee with subpoena power and with oaths taken by all those interviewed. Previous Post Previous Post IRS-GATE: EVERY SINGLE ORG WITH TEA PARTY IN NAME WAS REVIEWED……. Next Post Next Post EGYPTIAN SALAFIST: SHIITES MORE DANGEROUS THAN NAKED WOMEN…….